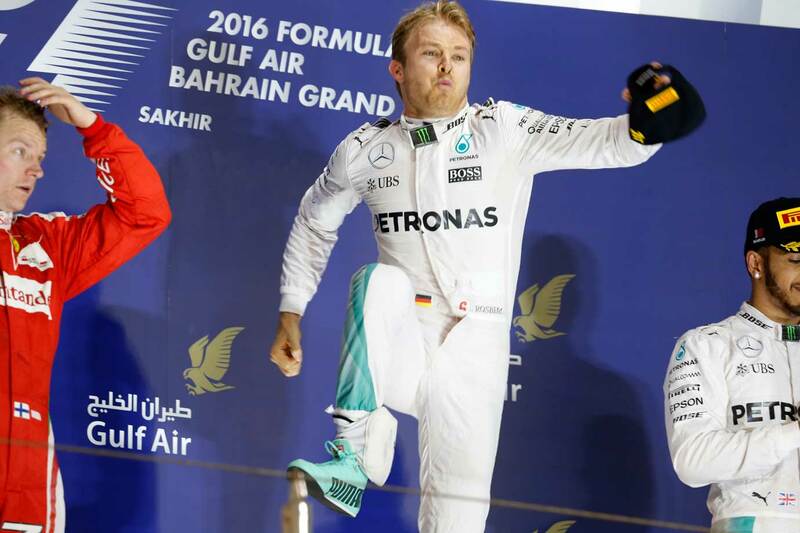 Manama: Nico Rosberg consolidated his lead in this year's embryonic drivers world championship in emphatic fashion on Sunday when he seized a well-judged victory for Mercedes in a dramatic Bahrain Grand Prix. Making the most of his team-mate and defending champion Lewis Hamilton's misfortunes, the 30-year-old German grabbed the advantage at the start and then controlled the 57-lap race. It was his second win this season after Melbourne, his fifth in succession and the 16th of his career, enabling him to double his points tally this season to 50. "It is just awesome for me to get another win," said Rosberg. "A great job by the whole team. The key, for me, was the start..."
Pole-sitter Hamilton, who had a slow start and then another Turn One collision, fought back from eighth on the opening lap to finish third, separated from his team-mate by Kimi Raikkonen. It was the eighth time the Finn, who finished second for Ferrari, 10.2 seconds adrift of Rosberg, had claimed a podium finish at the Bahrain International Circuit. "Not too bad," said Raikkonen. "I had a bad start and then we did what we could. We'll take second today." Raikkonen was left to fly the flag for Ferrari after his teammate Sebastian Vettel's Bahrain hopes ended in a cloud of smoke as his car's engine packed up on the warm-up lap. The four-time former world champion was well placed in third on the grid to mount a serious challenge to Mercedes on the front row. Hamilton, who was 30 seconds behind in third, is now second in the title race with 33 points ahead of Daniel Ricciardo on 24. The Briton, reflecting on his first lap misfortune, said: "That's twice its happened, but this had nothing to do with Melbourne. "Two separate incidents... But equally painful. I am just thankful to finish and score some points." Ricciardo finished fourth for Red Bull, for the second race in succession, ahead of Frenchman Romain Grosjean, who secured a fine fifth for the new American Haas team, and sixth placed Dutch teenager Max Verstappen of Toro Rosso. Daniil Kvyat finished seventh in the second Red Bull ahead of Felipe Massa of Williams, Valtteri Bottas in the second Williams who had smashed into Hamilton, and Belgian debutant Stoffel Vandoorne who took a point in his first race with McLaren, filling in for Fernando Alonso. Hamilton, who had broken the track record in claiming his 51st pole, arrived at the circuit in full traditional Arab dress, attracting a swarm of cameras as the sport's power-brokers debated the future shape of qualifying. Their 90 minutes' meeting ended in deadlock with a variety of proposals for the future on the table, but Hamilton was in no such mood and oozed confidence ahead of the twilight race. It began with drama and it remained dramatic as night fell - with Vettel suffering his first DNS in 159-races. When the lights went out, Hamilton was beaten off the line by Rosberg. The champion tucked in behind him on the run to Turn One where, as he turned in, Bottas attempted to pass on the inside. Hamilton's Mercedes was damaged and half-spun in the pack, dropping down the order. It was a repeat of his misfortune in Melbourne and, again, he had to recover and fight back from eighth. Bottas' actions appeared to be impetuous and the stewards hit him with a drive-through penalty. Hamilton had bodywork damage, but continued. On lap eight, Jenson Button, the 2009 champion, pulled into the McLaren garage, to retire followed by Esteban Gutierrez of Haas. After a series of pit stops Hamilton for a brief period lapped a second faster than the other leaders, but it was not enough to make an impact on the order. Rosberg remained in charge with Raikkonen chasing in vain.